My new mill - Page 4 - The Home Machinist! I had a friend who lived in an old train depot in the center of Amsterdam; the wiring was all pre-war. I'm talking WW1. 3-phase wires wrapped in tar soaked black linen disappeared into a hole in the floor. No one knew where the power even came from, or where it was fused or switched. Or metered. There were 10 apartments and workshops in the old building. So one day, someone shorted the line. As it heated and burned, the cables came into contact further up. A sort of chain reaction as each time the wires shorted closer to the source, the lower the resistance and the higher the current. The central train station was a couple of miles away. It turned out to be where the power line came from. 30% of the power there blew out, and no one there knew how it worked or where it was fused either. I guess whoever did had died 50 years before. It took a week to restore all the power at Amsterdam central railway station. My friend's place never did have their power restored. Likewise, my 240V mill power has 2 110V receptacles tapped into 1 leg, but neither has a fuse. The mill, however is plugged, yes, plugged, into a service connect box with 30A fuses. It is plugged into the box, because there is only 1 220V outlet in the garage and it is also used for the 220V Delta T&C grinder. The 110V is used for a light and for the table drive motor, and for the shop vacuum and whatever else needs power. And speaking of machine lights, I found that one of the 1" flexible coolant hoses works perfectly for a flexible light neck. Handy idea with the flex hose Earlgo! Always nice to have some new equipment in the home shop as encouragement to move on with projects. A friend installed a new Bridgeport in his home shop, just like this application in the corner where it looked good and seemed to fit well. Once he began to machine some long parts at extreme travel of the X axis, he had a nice set of holes knocked into the sheetrock to show where he had made a poor decision in his installation years before. At work we have a big Cincinnati #4 milling machine that is sitting on 6 by 6 inch timbers. Really raises the machine up to where even a tall person is challenged just in operation. It requires the use of a ladder to change tooling in the vertical head. The weight of the big milling machine does not seem to be a problem even if sitting on the timbers. Great advice but I don't think you guys understand just how small my shop is. 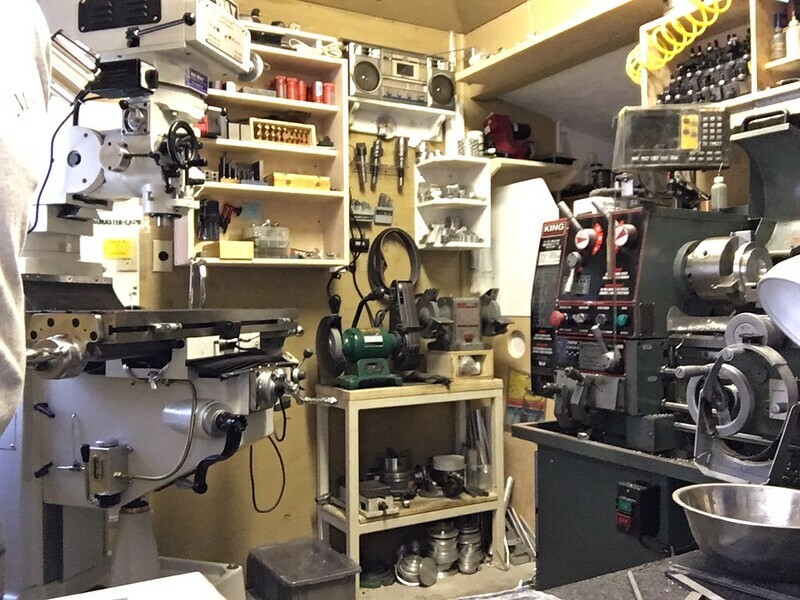 If I were to set it up the way you guys suggest I'd have to move everything else out of the shop It's ok though, all I do is small stuff fishing reel related so there won't be any holes in my walls. A good definition of compact! You'll appreciate the mill DRO for your work. Installing a 4-axis DRO on my mill seriously sped up my work rate. Just ordered a Top Tech Milling/Drilling Machine - BF20 from Penn Tool. I will be watching for delivery truck like a 3yr old waiting for Santa until it arrives.Took pretty much every $$ we had . Hoping to find someone who has some tooling they no longer need. All I have is a lockdown vise. Any help or advice would greatly be appreciated.